About Airwheel S9 service robot and brand new C series. Airwheel S9 and C series made their international debut on the 5-day-long exhibition CeBIT 2016 and Airwheel gained much from this international trade show. For Airwheel loyal fans, they were astonished by the release of Airwheel S9, the first wheeled mobile robot and the Airwheel C series, the first accessary. This time, the editor will introduce them in detail. Airwheel S9 was a two wheeled self-balancing robot miracle in the exhibition. No matter the Airwheel fans or the visitors, they were surprised, as they did not expected Airwheel released its AI device so quickly. Airwheel S9 adopts a series of solutions to enhance the controlling performance and improve the sense of comfort. In the near future’s promotion of plugins and software, S9 2 wheeled robot will enable more usage scenarios to serve people’s life, including personal companion, house service and Smart Home, etc. at present, Airwheel S9 is able to avoid obstacle automatically, with the comprehensive locating system and route planning system. In addition, Airwheel S9 is able to interact between human and computers, by virtue of internal laser radar and auditory collecting system. Also, the first Airwheel auxiliary devices arrested the public’s attention and predominated in the announcement. The primary function of Airwheel C3 and C5 is to protect the riders’ heads from being injured. The highlights of Airwheel C3 and C5 intelligent helmets for road safety lie in such functions as photography, video and review of pictures. Accompanying smart camera enables riders to take photographs or videos anytime, anywhere. When there is a call, the rider does not need to whip out his mobile phone and he could answer the call through Bluetooth, which is equipped in the intelligent scooter. Moreover, they can listen to music wearing the smart helmets. “Technology should serve the common people but not only the noble,” with this business creed, Airwheel considers that products require fun, wisdom and efficiency. 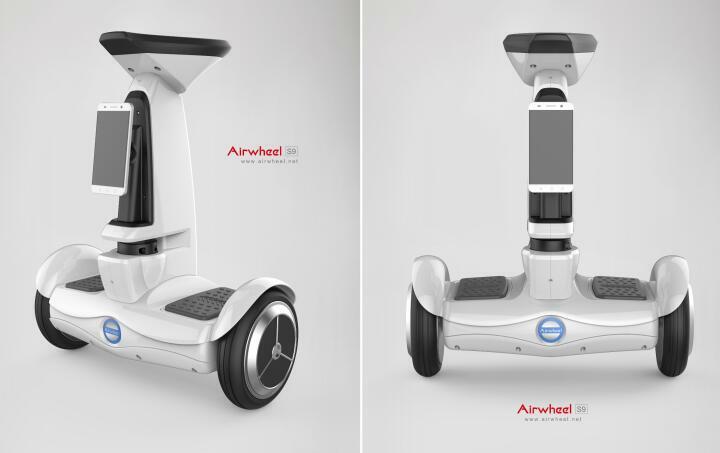 Next：Airwheel S8 two wheel electric walkcar wins not only from externality.